How’s Your Marketing Measurement Appetite? Welcome to summer, finally! Do you have any vacation plans? I took one in May, and not only did I have a great time, I found the inspiration for this post one morning while choosing between two breakfast alternatives. With any luck, my choice might inspire you in some way, or maybe just make you hungry. I’m a foodie. In May, I went to China with my partner Marilyn. The food we ate provided many of our vacation highlights, including my first ever bowl of Pu Gai Mian. On day eleven of our travels, I woke up in Chengdu with a very specific food craving. Having eaten nothing to that point but the outstanding local cuisine at each and every meal, I now wanted a bacon and eggs breakfast, the type served by greasy diners back home. This seemed a sacrilegious desire in the capital of China’s Sichuan province, whose cuisine I love. It was also unrealistic to expect to find such a diner in Chengdu. I sheepishly confessed my powerful craving to Marilyn. She suggested a solution to my problem, the hotel next door and its western breakfast buffet. It wasn’t a greasy diner, but it would do, and so we set off for the luxurious five-star Jin Jiang Hotel. The Jin Jiang’s buffet looked spectacular. Unfortunately, so was the price, which converted to $115 Canadian for the two of us. I knew that this spectacular solution could solve my problem. I was also pretty sure that, in this city of more than 6,000,000 people and I suppose thousands of eateries, there must be other less spectacularly priced breakfast alternatives. 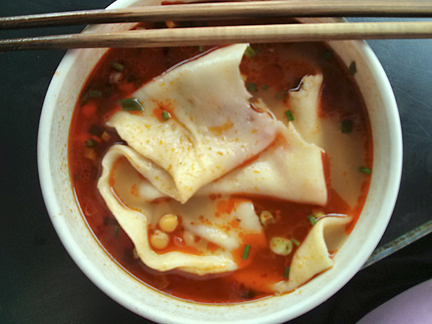 Marilyn proposed a Chengdu breakfast specialty, Pu Gai Mian, which translates to Bedspread Noodle. We soon found a little corner joint serving steaming hot bowls of the broad, multi-folded noodles in a spicy beef broth. We ordered two delicious bowls which together cost $3.20, a mere 2.7% of what the Jin Jiang wanted for their buffet. Pu Gai Mian – One Delicious Bite Missing! Our choice of breakfast options in Chengdu reminded me of the dilemma marketers face when trying to measure their marketing programs. Should they invest in a costly and sophisticated five-star measurement solution, or might a more modest bowl of noodles approach do the trick? The reality is that there are a lot of options available between the two extremes. Spectacular, high end solutions have their place at breakfast or in marketing, but why spend a lot when a little will suffice? Big Marketing Budgets: When there are big budgets to manage and a lot of revenue on the line, it makes sense to invest significantly in measurement to optimize the impact of your marketing. Complex Marketing & Customer Interactions: The more communication channels, marketing executions, customer touch points and data you have, the more you may need a robust measurement system. Big Measurement Appetite: This one is critical. If you opt for a pricy high-end solution, then you also need to support that through a substantial and ongoing organizational commitment to make measurement work. It is one thing to load up on the fancy technology and quite another to use it fully and leverage the benefits. In breakfast terms, if you choose the buffet, be sure to eat more than just toast and cereal. Sophisticated high-end marketing measurement solutions are impressive and may well be the right solution for many marketers, however, they’re not the right solution for all marketers, all the time. For a lot of marketers, sophisticated measurement solutions might be overkill and more than they need. Here are three reasons to be wary of overspending at the marketing measurement buffet. The Attribution Problem: Customer purchase decisions are influenced by multiple factors, many of which are outside of marketers’ control. Such decisions are both rational and emotional and the customers themselves likely don’t entirely understand which combination of marketing messages and incentives impact their purchase decisions, or to what degree. If customers don’t fully understand their own decisions, how can marketers reliably attribute their customers’ decisions to specific marketing programs? How much do you want to spend on something that is inherently difficult to measure? Flaws & Assumptions: One of the challenges with any approach to measurement is that there will be flaws in the data and the methodology, and assumptions will need to be made. Many assumptions will likely be flawed, largely due to the attribution problem. Thus, marketing measurement is an imperfect science and all methodologies will have their flaws. Efforts to make it more scientifically perfect and reliable will tend to add complexity and cost, pushing such a solution out of the reach of any organization who might be short on time, money, people and expertise to throw at marketing measurement. I’m guessing that could be a long list of organizations. Commitment: Most organizations have a hard time committing resources fully to measurement on an ongoing basis. Organizations can rightfully see measurement as a less urgent need than finding, serving and keeping customers. It can seem hard to give it the time and attention it needs, especially if the measurement approach is complex. That suggests a more simple and practical approach, requiring less support and involvement, might be a better fit for most organizations, especially those small to mid-sized. The Jin Jiang’s expansive buffet was awfully tempting, but all I really wanted was a diner breakfast, so it felt excessive. Then, when I compared its price tag to the alternative, it was easy to choose a more modest approach that turned out to be quite delicious and satisfying. As you contemplate how best to address your marketing measurement needs, keep in mind that you have many alternatives to choose from and none of them will be perfect. You may want what you perceive as the best but something seemingly lesser can give you just what you need. Scale your solution to the magnitude and complexity of your problem, and your appetite for marketing measurement. Note: For more information about the newsletter and to see testimonials, please click here. To check out past samples, click here to visit the archive.